I finished my March socks a little late, April 6 to be exact, but they are finished and I've dug into the stash and cast on for April's pair. These socks were finished just as the sun has started to shine and the weather become a bit Spring-like here in the 'burgh. These are the Embossed Leaves Socks by Mona Schmidt from Interweave Knits Winter 2005 and Favorite Socks. The project details can be found on my blog. I am now attempting to knit my first pair of toe-up socks. 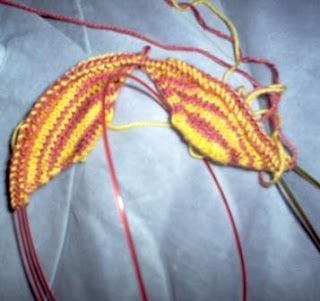 I used Judy's Magic Cast On and am following Wendy's Generic Toe-Up Sock Pattern to knit these. The yarn is Vancalcar Acres Flock Sock in the Something for Gryffindor colorway that I purchased from Woolgirl.com around the time when the new Harry Potter movie and book came out.